Two new VoIP phone systems from Telos Systems offer flexibility, AES67 support, outstanding call performance, and dramatic cost savings. The Telos Alliance®—leader in broadcast technology and parent company to Telos®, Omnia®, Axia®, 25-Seven®, Linear Acoustic®, and Minnetonka™—will launch two new Telos VX multi-line Voice over IP (VoIP) systems at IBC 2018 in stand #8.D47 at the RAI Amsterdam, September 14-18. VX Enterprise and Prime+ offer more choices and give broadcasters flexibility to specify the right VX system for any size facility. Support for AES67, outstanding call performance, and cost savings all contribute to making these the most powerful broadcast VoIP systems on the market today. Telos VX Enterprise is ideal for VoIP phone systems for medium to large facilities with a capacity expandable up to 120 connected hybrids. Telos VX Prime+ is an 8-hybrid solution for small to medium facilities. "Telos VX was the world’s first VoIP talk show system and has since become the industry standard for the best-sounding calls on the air," says Marty Sacks, VP of Sales, Support, and Marketing for the Telos Alliance. "Enterprise and Prime+ are the next evolution in the legendary line adding AES67 while offering all the performance that VX systems are known for, not to mention the dramatic savings that come hand in hand with switching from analog to VoIP phone lines. Broadcasters tell us that VX pays for itself in a little over a year." 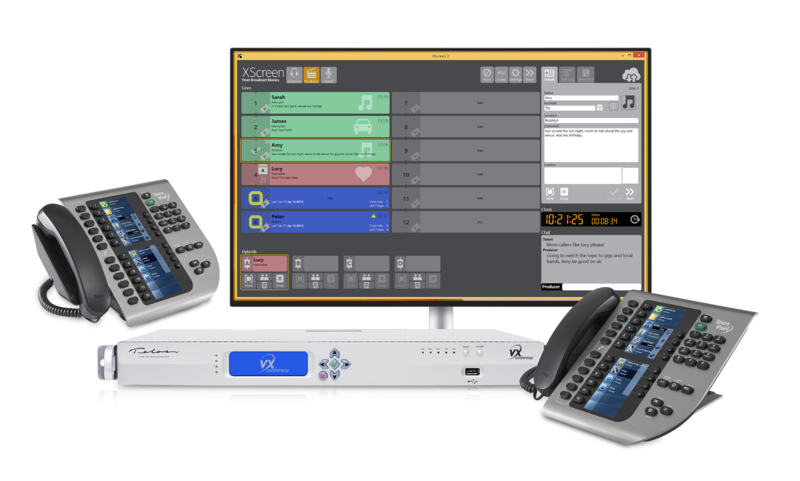 AES67 support brings a new level of compatibility and flexibility to VX Enterprise and VX Prime+ phone systems. Support for AES67 gives broadcasters the flexibility of integrating VX into any AES67 environment, in addition to Axia's own Livewire® network. With plug-and-play connectivity, broadcasters can network multiple channels of audio with any manufacturer’s AES67-compliant hardware. Beyond AES67, Livewire users have the added convenience and power of networking control (GPIO), advertising/discovery, and program associated data throughout the network. Built on a powerful new 1RU server, VX Enterprise and Prime+ feature industry-leading performance thanks to exclusive fifth-generation Telos Adaptive Hybrid technology. This includes Digital Dynamic EQ, AGC, adjustable caller ducking, and send- and receive-audio dynamics processing by Omnia. Additionally, wideband acoustic echo cancellation from Fraunhofer completely eliminates open-speaker feedback. Meanwhile, support for the G.722 codec enables high-fidelity phone calls from iPhone and Android SIP phones using an SIP server, so callers sound clean and clear despite the device they are using. VX Enterprise and Prime+ wed modern networking to the remarkable power of digital signal processing. Both systems use Ethernet as their connection backbone, significantly cutting the cost of phone system installation, maintenance, phone service, and cabling, while offering considerable ROI. VX uses standard SIP protocol that works with many VoIP PBX systems and SIP Telco to take advantage of low-cost and high-reliability service offerings. These systems can also connect to traditional telco lines via Asterisk PBX systems, which can be customized for specific facility requirements.